This beautiful Warm Shades crocheted baby blanket have a delightful and warm color palette. The crocheted baby throw consists of 20 large granny squares that have been crocheted together. The blanket is then finished off with a lovely crocheted edge. Once completed, the crocheted blanket should measure about 25.5 inches by 31.5 inches. In metric measurements, the finished delightful baby blanket should be approx. 65 cm by 80 cm. You can access the FREE pattern for this adorable crocheted granny square baby blanket from Drops Design. 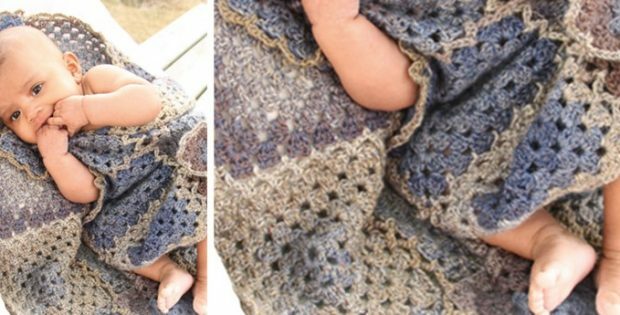 To access the free crochet pattern for this gorgeous baby throw, please click here: Warm Shades Baby Blanket Pattern.